Last month I was nauseated and lightheaded for two weeks. Those aren’t common symptoms in this phase of my healing, so we could NOT figure out what was going on. After a lot of research and ruling things out, I discovered some fascinating information that not only was helpful for the immediate symptoms, but is also a catalyst for reducing digestive symptoms in general. Storms can feel like dark setbacks, but the big waves are the ones that get you closer to shore in the end. 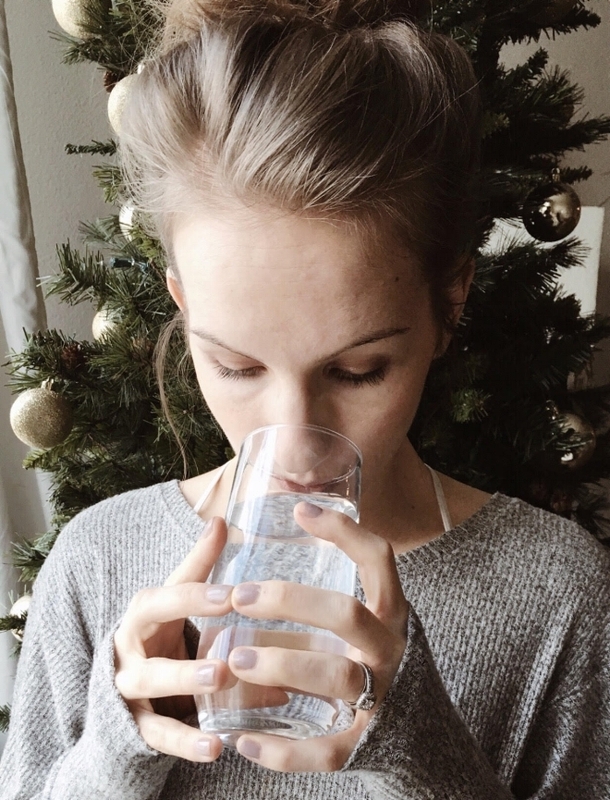 This post fits under my list of “I sure wish a doctor or a Google search would have told me this years ago!” Turns out, hydration is a lot different than just “drinking more water” and not only is it critical to general health, but also to common GI symptoms. ***The below information is based on my research, education, and personal experience and is not to be used as a medical diagnosis. You should always consult your doctor and find what works best for your unique body. Mild to severe dehydration can cause, but are not limited to: constipation, fever, chills, headache, dizziness, poor nutrient absorption (sometimes indicated through white spots on your fingernails, hair growth, fatigue, etc), nausea, and light headedness. How does dehydration affect gut health? If you answer yes to any of these, this is important! If you are moderately to severely dehydrated, you are typically unable to produce adequate amounts of stomach acid. Low stomach acid impacts digestion because you need adequate stomach acid in order to break down food. If food isn’t broken down properly, it can create intolerance, slow motility, and can sit in the GI tract and start to ferment, which can cause painful trapped gas. Thus these symptoms are greatly impacted (though not necessarily solely caused by) dehydration. Additionally, the immune system suffers in a state of dehydration because there isn’t enough stomach acid to kill bad bacteria, which could manifest as imbalances in your microbiome. A lack of proper hydration also keeps your body from being able to flush out toxins, thus keeping you in a sate of compromised immune function and chronically feeling fluy or getting sick. Hydration is also important for detoxification, organ function, balance of hormones, reducing acid reflux and heartburn, and regulating PMS. This is where we’re typically told, “You’re dehydrated because you don’t drink enough water.” But it’s much more complex than that and much less your fault than that. If you have multiple of these factors in tandem, you’re even more primed for extreme dehydration. So if the answer isn’t “drink more water,” how do you get hydrated? In order to be hydrated you have to ABSORB water…which doesn’t always happen. You can probably relate if you feel like water in = water out, or if you feel bloated or nauseous after drinking water, like your stomach is just a holding tank until it passes through, rather than diffusing into the cells of your body. In order for your body to absorb water it needs adequate minerals, salts, and electrolytes (minerals that carry electrical charges). Depending on your lifestyle, diet, genetics, and considering that depleted soil can leave our crops lacking their full mineral content, it’s very common to be mineral deficient, and thus supplementation in moderation can be helpful. How can you support hydration? If these symptoms and information is resonating with you and you’re nodding your head “yesssssss,” here are a few things to consider implementing to support your body, hydrate your gut, and reduce the above symptoms (again, hydration may not be the sole cause of symptoms, but is nonetheless a very important puzzle piece to feeling your best). -Liquid IV is a hydration powder that you mix into water and it’s highly recommended by top hydration specialists (it tastes similar to Gatorade). You can buy it at Costco or online. It does contain 11g of cane sugar per serving, so if you’re sensitive to processed sugars, it might not be your top choice. But in terms of function and taste it’s a top recommendation. -Lyte Show is a great hydration supplement that contains zero sugar or additives. It tastes basically like salt water, so not the most appealing, but not awful. -Coconut water is naturally full of minerals, so it’s wonderful for hydration and absorption. Look for brands without added sugar, as the coconut water itself contains natural sugar. -Nooma and Nuun are good options if you want something you can just grab at the store that has pretty good ingredients and multiple flavor options. A few retailers including Whole Foods carry them. -Good State specialized in liquid mineral supplements and mineral analysis if you want to find out if you’re specifically deficient in any minerals. They sell a Liquid Ionic Trace Minerals supplement as well as many others. Have you had an experience with dehydration? What were your symptoms? What helped you? Share with us in the comments below, your experience might be helpful for another reader! Enter your name and email address below and I’ll send new content sent straight to your inbox so you never miss out!